Dale T. Crabtree was born circa 1916 at Oregon. He was the son of Floyd Cecil Crabtree and Cora Belle Thomas. Dale T. Crabtree married Linore (?) before 1939. [S243] U.S. Federal Census 1920 U.S. Federal Census, by Ancestry.com, ED330. Dwelling 58. [S250] U.S. Federal Census 1930 U.S. Federal Census, by Ancestry.com, ED24-81. Dwelling 4. Rae D. Crabtree was born circa 1917 at Oregon. Rae D. Crabtree died before 1998. [S373] U.S. Federal Census 1940 U.S. Federal Census, by Ancestry.com, Year: 1940; Census Place: Salem, Marion, Oregon; Roll: T627_3374; Page: 5B; Enumeration District: 24-58. Name Variation Maxine Crabtree was also known as Jennie M.
Married Name Her married name was Bullock. Name Variation Maxine Crabtree was also known as J. Maxine. Maxine Crabtree married Charles L. Bullock. Maxine Crabtree was born circa February 1919 at Oregon. She was the daughter of Floyd Cecil Crabtree and Cora Belle Thomas. Shirley G. Thomas was born in 1919 at Oregon. She was the daughter of McClellan Thomas and Margaret Ann Ashenfelter. 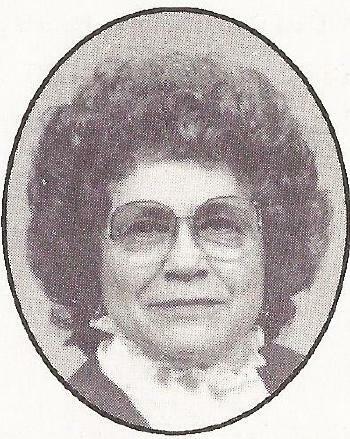 Verda M. Mollet was born circa 1919 at Oregon. She was the daughter of Arthur William Mollet and Ethel M. Roper. [S243] U.S. Federal Census 1920 U.S. Federal Census, by Ancestry.com, ED5. Dwelling 222. [S250] U.S. Federal Census 1930 U.S. Federal Census, by Ancestry.com, ED6-23. Dwelling 191. Married Name circa 1917 As of circa 1917,her married name was Kloeppel. Eva Lena Winter married Clarence E. Kloeppel, son of Peter Kloeppel and unknown (? ), circa 1917. Eva Lena Winter died in September 1981 at age 89. Eva Lena Winter obtained US Social Security Card at Minnesota; last residence Chesapeake, Chesapeake City, Virginia. [S9] South Dakota, South Dakota Birth Records South Dakota, State File Number: 774197 (unknown file date). [S243] U.S. Federal Census 1920 U.S. Federal Census, by Ancestry.com, ED78. Dwelling 29. [S250] U.S. Federal Census 1930 U.S. Federal Census, by Ancestry.com, ED22-13. Dwelling 321. Name Variation Lucy Dorothy Winter was also known as Louise Dorothy. Married Name circa 1906 As of circa 1906,her married name was Beers. Lucy Dorothy Winter married George Beers circa 1906. Lucy Dorothy Winter died in 1965. [S243] U.S. Federal Census 1920 U.S. Federal Census, by Ancestry.com, ED261. Dwelling 11. [S250] U.S. Federal Census 1930 U.S. Federal Census, by Ancestry.com, ED68-25. Dwelling 25. Name Variation Wilhelmina Augusta Winter was also known as Minnie. Name Variation Wilhelmina Augusta Winter was also known as Winthrop. Married Name 24 February 1920 As of 24 February 1920,her married name was Rockwood. Wilhelmina Augusta Winter died in September 1971 at age 75. Wilhelmina Augusta Winter obtained US Social Security Card at Iowa; last residence Saint Paul, Ramsey, Minnesota. [S9] South Dakota, South Dakota Birth Records South Dakota, State File Number: 623255 (unknown file date). [S250] U.S. Federal Census 1930 U.S. Federal Census, by Ancestry.com, ED97-51. Dwelling 249. [S373] U.S. Federal Census 1940 U.S. Federal Census, by Ancestry.com, Year: 1940; Census Place: Sioux City, Woodbury, Iowa; Roll: T627_1216; Page: 14B; Enumeration District: 97-75. Married Name Her married name was Mader. Name Variation Ernestine Charlotte Winter was also known as Tena. Married Name 6 April 1920 As of 6 April 1920,her married name was Jonason. Ernestine Charlotte Winter married Allen Jonason on 6 April 1920 at 1st marriage for both, Yankton, South Dakota, listed as Ernestine Winters. Ernestine Charlotte Winter died on 18 March 1960 at age 64. [S9] South Dakota, South Dakota Birth Records South Dakota, State File Number: 775841 (unknown file date). Married Name circa 1897 As of circa 1897,her married name was Leder. Mary (?) was born in September 1874 at Germany. She married Adolph Leder, son of Samuel Leder and Elizabeth Mollet, circa 1897. Mary (?) immigrated in 1882. She was naturalized in 1897. She had 1 with 1 living in 1900 children. [S245] U.S. Federal Census 1900 U.S. Federal Census, by Ancestry.com, ED93. Dwelling 17. [S243] U.S. Federal Census 1920 U.S. Federal Census, by Ancestry.com, ED5. Dwelling 165. [S250] U.S. Federal Census 1930 U.S. Federal Census, by Ancestry.com, ED2-6. Dwelling 127. Martha M. Leder was born circa 1909 at Oregon. She was the daughter of Adolph Leder and Mary (?). Esther E. Leder was born circa 1911 at Oregon. Adolph C. Leder was born on 23 March 1913 at Oregon. He was the son of Adolph Leder and Mary (?). Adolph C. Leder died on 4 July 1997 at age 84. Adolph C. Leder obtained US Social Security Card at Oregon; last residence Kelso, Cowlitz, Washington. Name Variation Anna Brill was also known as Annie. Married Name circa 1903 As of circa 1903,her married name was Leder. Anna Brill was born circa 1883 at Ohio. She married Robert A. Leder, son of Samuel Leder and Elizabeth Mollet, circa 1903. [S272] Oregon Death Index, 1903-98 (published), Certificate: 12563. [S243] U.S. Federal Census 1920 U.S. Federal Census, by Ancestry.com, ED5. Dwelling 207. [S250] U.S. Federal Census 1930 U.S. Federal Census, by Ancestry.com, ED2-6. Dwelling 111. Mabel Violet Leder was born on 21 March 1906 at Arkansas. She was the daughter of Robert A. Leder and Anna Brill. [S272] Oregon Death Index, 1903-98 (published), Certificate: 95-18007. Milford Edward Leder was born on 7 July 1907 at Ohio. He was the son of Robert A. Leder and Anna Brill. [S272] Oregon Death Index, 1903-98 (published), Certificate: 82-07205. Name Variation Joseph Koranda was also known as John. Joseph Koranda was born on 1 March 1878 at Chicago, Cook, Illinois. He was the son of John Koranda and Mary (?). Joseph Koranda married Mathilda Wilhelmina Winter, daughter of John Ludwig Winter and Josephine Mollet, on 28 December 1897 at Utica, Yankton, South Dakota. Joseph Koranda died on 20 June 1937 at age 59. [S245] U.S. Federal Census 1900 U.S. Federal Census, by Ancestry.com, ED347. Dwelling 128. Married Name after April 1930 As of after April 1930,her married name was Hoyt. Hattie Marie Koranda married Clifford Hoyt after April 1930. Hattie Marie Koranda died in April 1979 at age 78. Hattie Marie Koranda had zero children. She obtained US Social Security Card at Minnesota; last residence Harlingen, Cameron, Texas. [S250] U.S. Federal Census 1930 U.S. Federal Census, by Ancestry.com, ED68-6. Dwelling 99. Glenn Dayton Koranda was born on 16 June 1916 at Lesterville, Yankton, South Dakota. He was the son of Joseph Koranda and Mathilda Wilhelmina Winter. Donald Dale Koranda was born on 1 September 1921 at South Dakota. Married Name 2 October 1926 As of 2 October 1926,her married name was McCain. Mabel Lorene Jones was born on 10 December 1903 at Van Wert, Decatur, Iowa. She married Holsey Charles McCain, son of George Jay McCain and Iva Lillie Mercer, on 2 October 1926 at Des Moines, Polk, Iowa. Mabel Lorene Jones died on 27 April 1999 at Perry, Dallas, Iowa, at age 95. [S250] U.S. Federal Census 1930 U.S. Federal Census, by Ancestry.com, ED52-16. Dwelling 140-167. Richard W. Flados married Dolores Jean Hajek, daughter of Victor Hajek and Anna Urbanovsky. Richard W. Flados was born on 5 March 1925 at Texas. Richard W. Flados died on 16 April 1999 at Tarrant, Texas, at age 74 FORT WORTH - Richard W. Flados, 74, who retired after 36 years of service as an aeronautical engineer with Lockheed Martin, died Friday, April 16, 1999, at a Fort Worth hospital. Mass of Christian Burial: 10 a.m. Wednesday at Holy Family Catholic Church. Celebrant: the Rev. Joe Pemberton. Burial: Mount Olivet Cemetery. Visitation and vigil: 7 p.m. Tuesday at Thompson's Harveson & Cole Funeral Home. Memorials: Tarrant Alliance for the Mentally Ill, 1500 W. Fifth St. Fort Worth, Texas 76102, or a charity of choice. Richard Flados was born March 6, 1925, in Nocona to Ole and Una Flados. He received his early schooling in Henrietta, Nocona and Wichita Falls, and attended the University of Texas at Austin. After discharge from the U.S. Marine Corps, he resumed his engineering studies and graduated from Georgia Tech University in 1947. He returned to Fort Worth and worked for General Dynamics Corp. until his retirement in 1987. He was preceded in death by a daughter, Jeanne Sue Flados. Survivors: Wife of 45 years, Dolores; sons, David and wife, Kay, of Fort Worth and Paul and wife, Kim, of Wilmington, N.C; daughter, Vicki Allen and husband, Bryan, of Sulphur Springs; grandchildren, Christopher and Mathew Flados and Thurman, Andrew and Jesse Allen; and brother, Norman Flados of Harlingen. Fort Worth Star-Telegram (TX) - Tuesday, April 20, 1999. He was buried after 16 April 1999 at Mount Olivet Cemetery, Fort Worth, Tarrant, Texas. Richard W. Flados obtained US Social Security Card at Texas; last residence Fort Worth, Tarrant, Texas. Married Name Her married name was Wiedman. Name Variation Mavis Irene Kinsley was also known as Maria. Mavis Irene Kinsley married Emil Wiedman. Mavis Irene Kinsley was born on 26 September 1917 at South Dakota. She was the daughter of Dell Kinsley and Berniece Irene Figert. Mavis Irene Kinsley died on 1 September 1988 at age 70. Mavis Irene Kinsley obtained US Social Security Card at South Dakota; last residence Mission, Todd, South Dakota. Married Name 29 August 1937 As of 29 August 1937,her married name was Davenport. Mildred Arlene Kinsley was born on 2 January 1919 at Davison, South Dakota. Mildred Arlene Kinsley married William Davenport on 29 August 1937 at Jones, South Dakota. Mildred Arlene Kinsley died before 2005. Married Name Her married name was Furrey. Married Name Her married name was Furry. Antha Marie Kinsley married Gerald Harvey Furrey. Antha Marie Kinsley was born on 4 January 1921 at Murdo, Jones, South Dakota. Antha Marie Kinsley died on 18 September 1963 at age 42. She was buried after 18 September 1963 at Mount Hope Cemetery, Valentine, Cherry, Nebraska. Married Name 18 January 1946 As of 18 January 1946,her married name was Davies. Ruby Ione Lykken was born on 17 August 1920 at South Dakota. She was the daughter of John L. Lykken and Minnie Charlotte Anderson. Ruby Ione Lykken married David John Davies on 18 January 1946 at Cook, Illinois. Ruby Ione Lykken died in March 1991 at age 70. Lloyd Eldon Lykken was born on 12 February 1922 at South Dakota. He was the son of John L. Lykken and Minnie Charlotte Anderson. Lloyd Eldon Lykken died on 24 April 1974 at Arlington Heights, Illinois, at age 52 Lloyd E. Lykken, 52, of Arlington Heights, died Wednesday morning at his home after an apparent heart attack. He was pronounced dead at Northwest Community Hospital, Arlington Heights. Born in Alcester, S.D., Feb. 12, 1922, he was a veteran of World War II, and was employed as an engineer for the Deublin Co. in Northbrook. Visitation is Friday from 3 to 5 p.m. and from 7 to 9:30 p.m. in Ahlgrim and Sons Funeral Home, 201 N. Northwest Hwy., Palatine. He is survived by his widow, Ina, nee Sylliaasen; five sons, Larry, Mark, Luke, David and James; two daughters, Darla and Dawn, all at home; parents, John and Minnie Lykken of Elmwood Park; a sister, Mrs. Ruby (David) Davies of Chicago, and a brother, Kenneth and sister-in-law, Doris Lykken of Lombard. He was preceded in death by a brother, Palmer. Funeral service will be held at 1 p.m. Saturday in Christ Lutheran Church, 41 S. Rohlwing Rd., Palatine. The body will lie in state in the church from 10 a.m. until time of service. The Rev. Dennis V. Griffin will officiate. Then the body will be taken to Throndhjem Lutheran Church, Volin, S. D. , where a funeral service will be held at 2 p.m. Monday. The Rev. Gary Anderson will officiate. Interment will be in the church cemetery. Family requests, in lieu of flowers, memorial donations may be made to Christ Lutheran Church, Palatine. - The Daily Herald (Chicago, Illinois) April 25, 1974. He was buried after 24 April 1974 at Trondhjem - Volin Cemetery, Yankton, South Dakota, Tec4 US Army. Lloyd Eldon Lykken obtained US Social Security Card at Illinois; last residence not specified. He and Ina Avenelle Sylliaasen lived in December 1961 at 1111 N Yale Ave, Arlington Heights, Illinois. 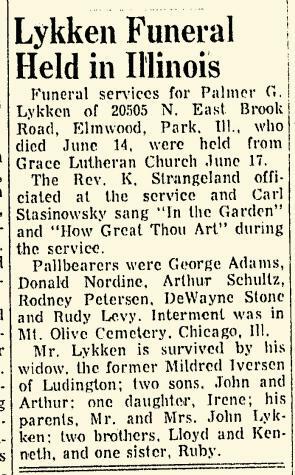 Name Variation Palmer John Lykken was also known as Palmer Gerald. Palmer John Lykken was born on 20 November 1923 at South Dakota. 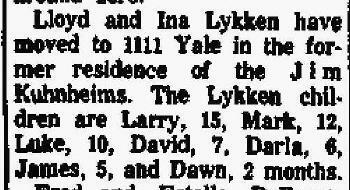 Palmer John Lykken married Mildred Irene Iversen, daughter of Ingvald M. Iversen and Anne Sofia Branstad, on 19 April 1947 also reported as 1946; Mildred Iversen and Palmer G Lykken marriage announcement. 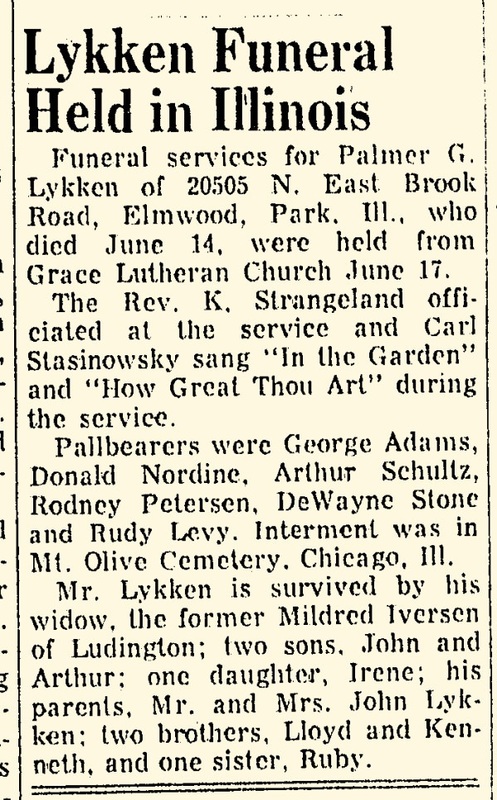 Palmer John Lykken died on 14 June 1960 at age 36 Palmer G Lykken obituary. 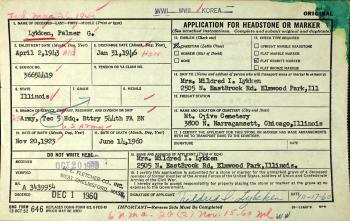 He was buried on 17 June 1960 at Mount Olive Cemetery, Chicago, Cook, Illinois. Kenneth John Lykken was born on 11 March 1926 at South Dakota also reported as 11 MAR 1925. 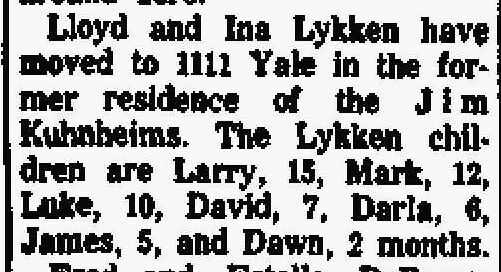 Kenneth John Lykken married Doris (?) circa 1947. Kenneth John Lykken died on 31 January 2003 at age 76. Kenneth John Lykken obtained US Social Security Card at Illinois; last residence Mountain Home, Baxter, Arkansas. Name Variation Ladell J. Anderson was also known as Ladella. Married Name 21 August 1948 As of 21 August 1948,her married name was Kraakmo. 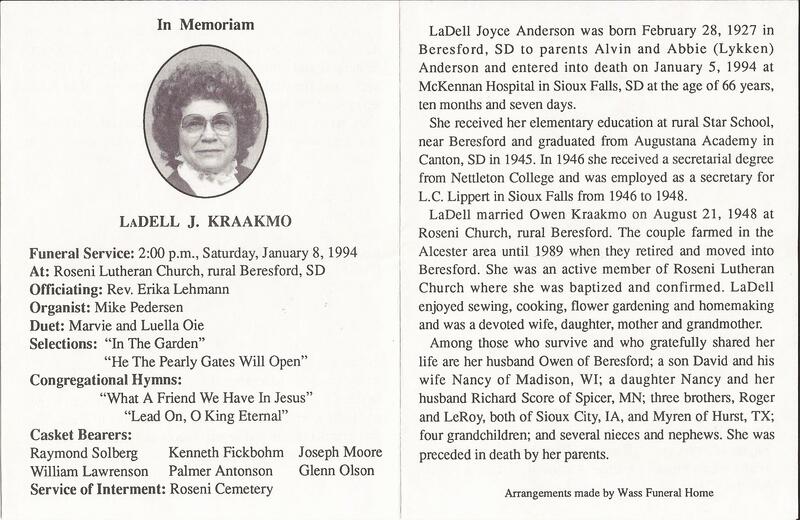 Ladell J. Anderson was born on 28 February 1927 at Beresford, Union, South Dakota. She was the daughter of Alvin Joel Anderson and Abbie Oliva Lykken. Ladell J. Anderson married Owen E. Kraakmo on 21 August 1948. Ladell J. Anderson died on 5 January 1994 at Sioux Falls, Union, South Dakota, at age 66. 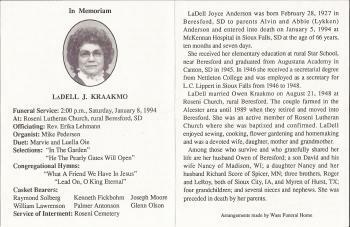 She was buried on 8 January 1994 at Roseni Cemetery, Beresford, Union, South Dakota.